A Forest of Stars’ 2012 A Shadowplay for Yesterdays found the English band stepping up their game with a collection of extreme metal songs as deep as it was broad, audaciously cycling through a taxonomy of mostly British genres: progressive and psychedelic rock, the UK folk revival and its apocalyptic neo-folk offshoot, goth rock, post-punk, black and doom metal. In its gloomy, rained-out, misanthropic, occasionally uplifting way, it is perhaps the most English album ever recorded (especially if you factor in the bonus tracks). If it has a weakness it is the flaw that most eclectic music shares by necessity. In the absence of a strong center, the parts end up upstaging the whole. It is an album of exquisite parts. And to be sure, I love every one of them. With Beware the Sword You Cannot See, A Forest of Stars have taken a tighter, denser approach, fusing the disparate genres into a single, emphatically convincing sound that is fully the band’s own. This is by far the band’s strongest album, and it’s also the most unrelenting, heavy and difficult to absorb. To understand what I mean more fully, it’s helpful to look at a single song. Almost right from the start, the first track overwhelms you with a churning distorted riff that recalls the band’s more Neurosis-influenced days before violinist Katheryne sets in with an elegantly downcast melody, injecting a mustier atmosphere, something a little sadder, a little gentler. But before you can mellow out, the band unleashes a meteoric torrent of guitars and rapid-fire drumming that reminds you that, yes, you’re listening to a metal band. This is followed by a reprieve of horror movie atmosphere and spoken word that segues to a heavy (and proggy) mid-tempo riff and a folky, multi-layered vocal arrangement that sounds absolutely end of the world with the heavy accompaniment. Wrapping things up, a short section with a hazy organ creates a classic space rock vibe that launches the song into its finale, a deeply melancholy guitar and keyboard riff that trudges despairingly forward, eventually replaced by a achingly beautiful violin harmony that seems to hover over the dim reflective puddles of a barren landscape. The sound here is so densely packed it can initially be difficult to separate the different parts and influences. If you listen carefully, you can hear traces of Comus, Current 93, Gabriel-era Genesis, Pink Floyd, Neurosis, Bauhaus, and assorted black and doom metal bands, but the band never apes them. The last 40 years of Anglo-American music is just the toolbox they use to present their incomparable atmosphere and aesthetic.Their sound rambles over a whole history of rural and urban moods, from overcast and sodden green valleys to glass-and-steel Victoriana, from industrial slums to failing farms. The tone they generate is by turns decrepit, morose, gritty, ethereal, entropic, wistful and beautifully defiant. The feeling I always come away with is eschatological: the end of all things, or more often than not, a single person–the end of all things for each of us. The splendid cover art’s references to Ragnarok gives you an idea. As always, the lyrics here are very inward-looking and subjective and despite the occasional occult or metaphysical turn (this is a band that has had its fun with nineteenth-century Spiritualism after all), are more about the business of life, struggle and death than any kind of cheap gothic or pagan metal back-to-nature satisfactions–suffering, private and public, is a major theme, one that almost gnaws at the attentive listener. The vocals are mostly spoken, hysterically bellowed or growled by Mr. Curse, but more melodic lilting is conservatively employed throughout the album–along with the quieter atmospheric breaks, I wish there were more of these moments. As much as I enjoy Mr. Curse’s heady theatricality, the mad affect can begin to grind on one’s senses after a while. Overall, I would welcome less bombast and more emphasis on musicality, something the band is certainly capable of. I’ve been somewhat obsessed with A Forest of Stars since their debut The Corpse of Rebirth, and they’ve come a long way since then to create a wholly one-of-a-kind sound. 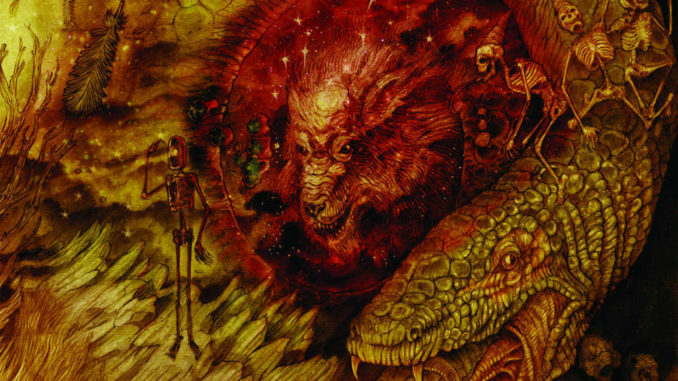 Despite my few minor misgivings, I am pleased to say that the band have certainly topped A Shadowplay (perhaps my favorite record of 2012) and have created a true metal classic with Beware the Sword You Cannot See. They have confidently brought all of their arcane interests and reference points together into one singular vision, one that is as inspiring as it is grim. I can’t wait to see what they do next. 07 – Part II: Have You Got A Light, Boy?